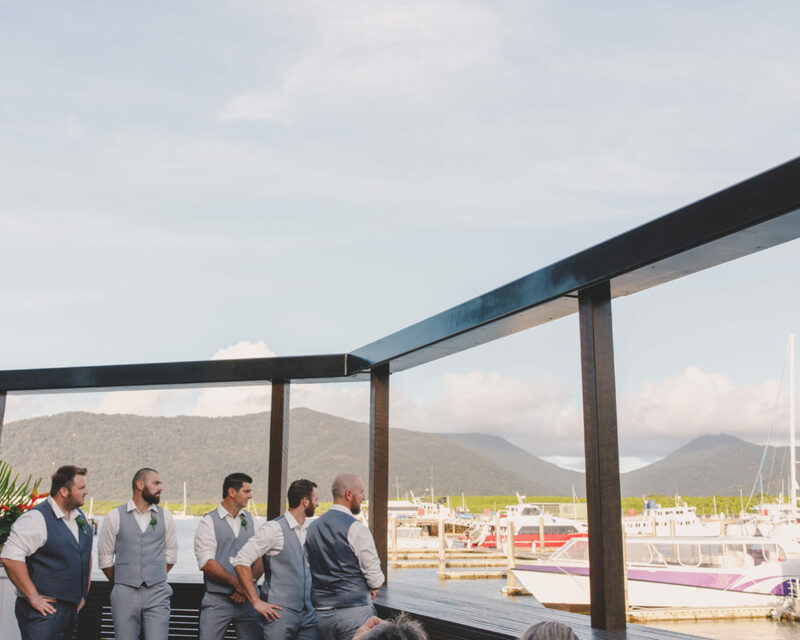 The perfect view to say "I Do"
There’s not many venues where you can literally get married on the water with stunning views of the Trinity Inlet and beyond. 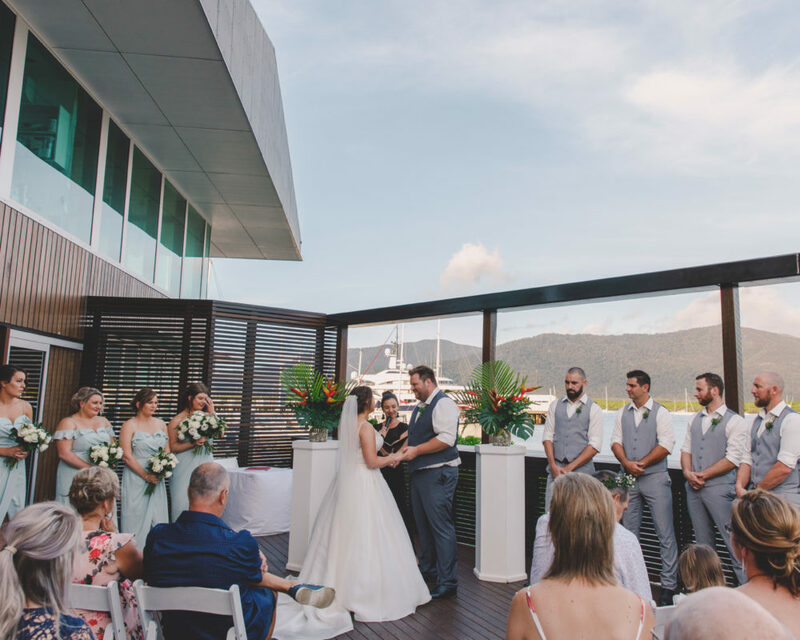 Imagine the memories you and your guests will take from celebrating the most important day of your life in this unique location – our dedicated Wedding and Events Team will help you plan and deliver a superb event tailored your needs. 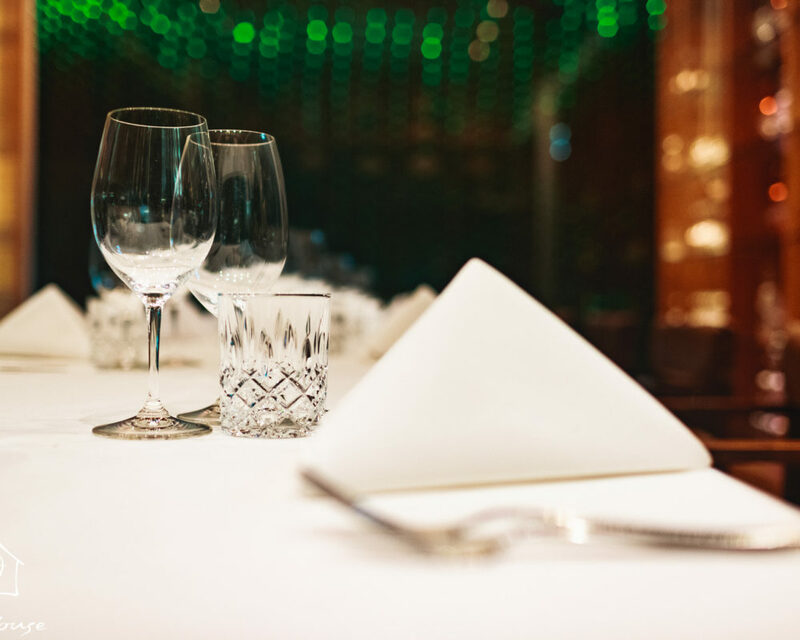 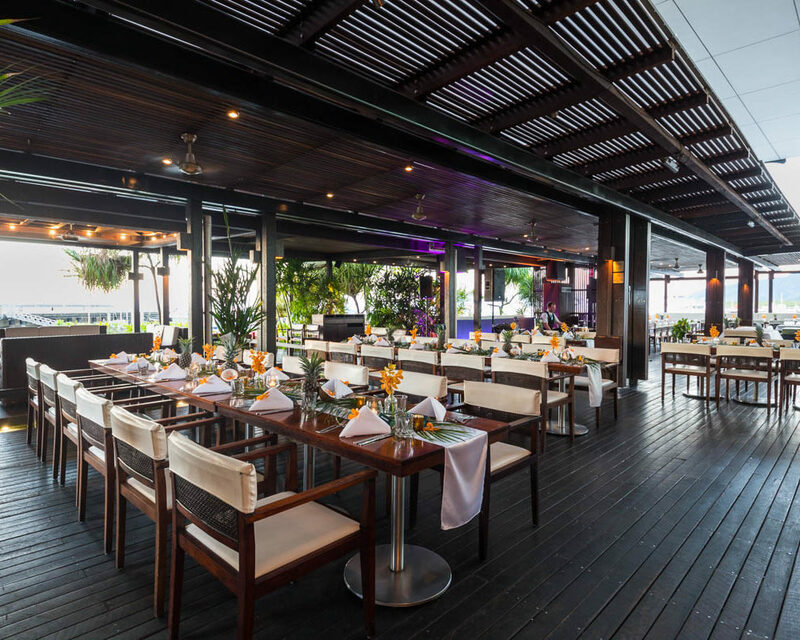 From small, intimate dinners to grand celebrations in open spaces we have the right spot for you. 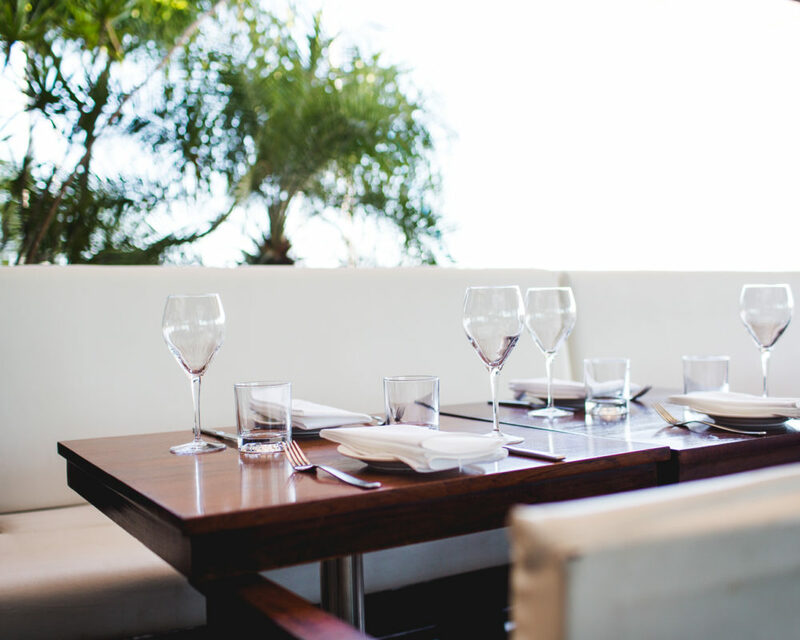 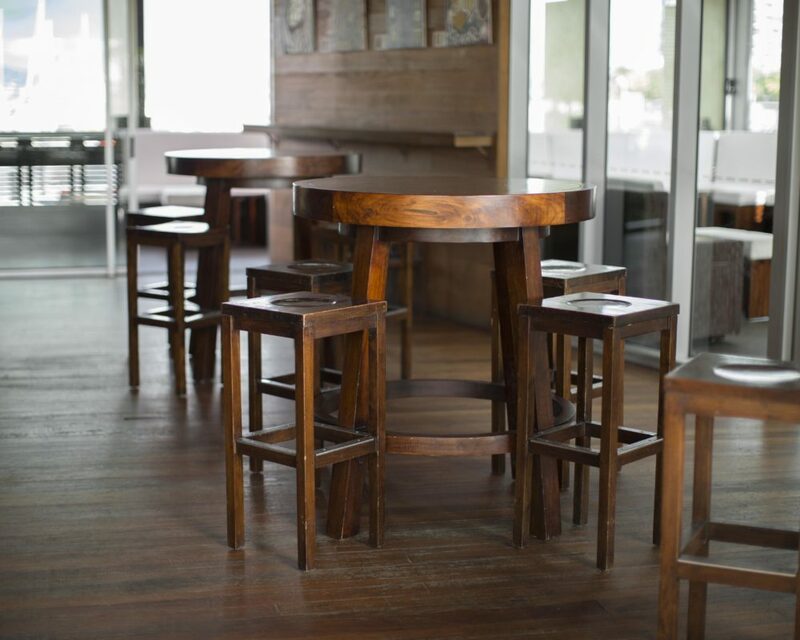 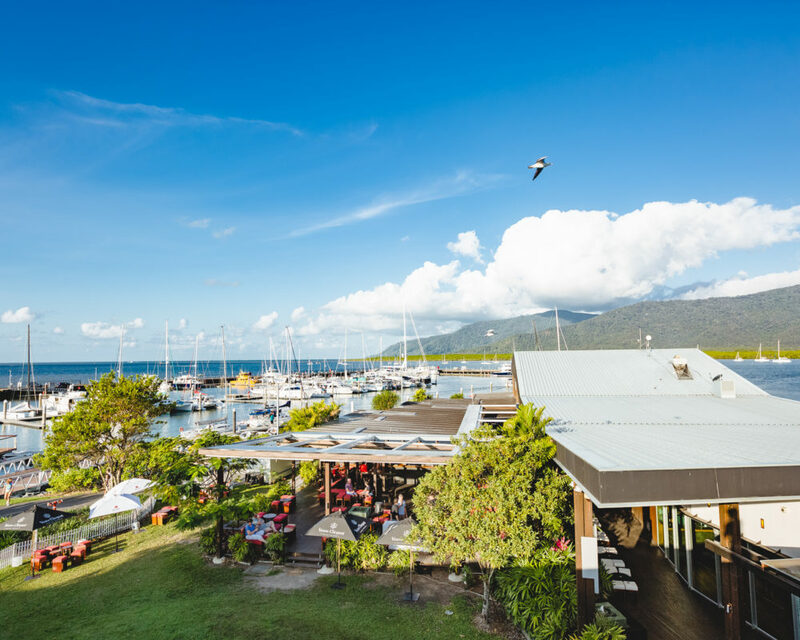 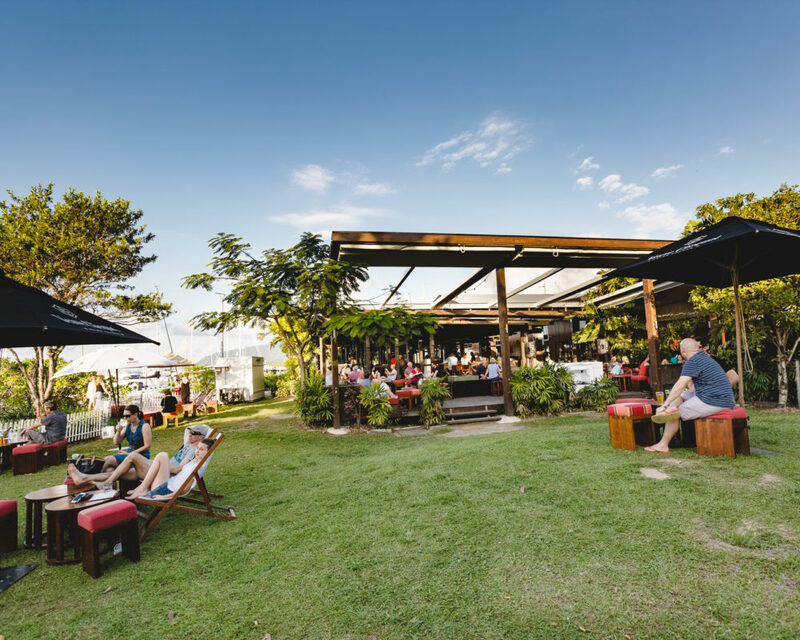 Perched literally on the water’s edge, our outdoor restaurant boasts stunning views of Cairns Marina and more. 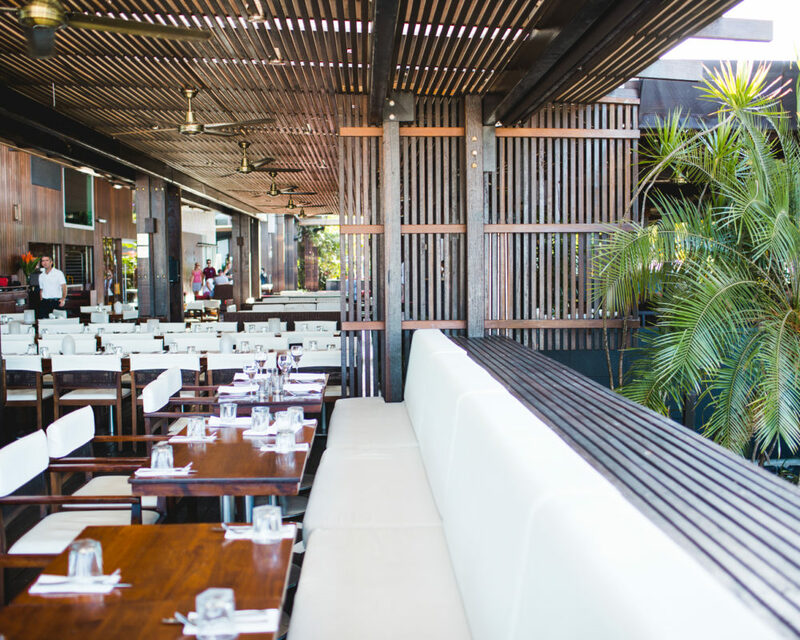 Seating up to 200 guests, including a large outdoor feel dining space, inside seating with a view of our Argentinian wood fired grill, and several semi private areas. 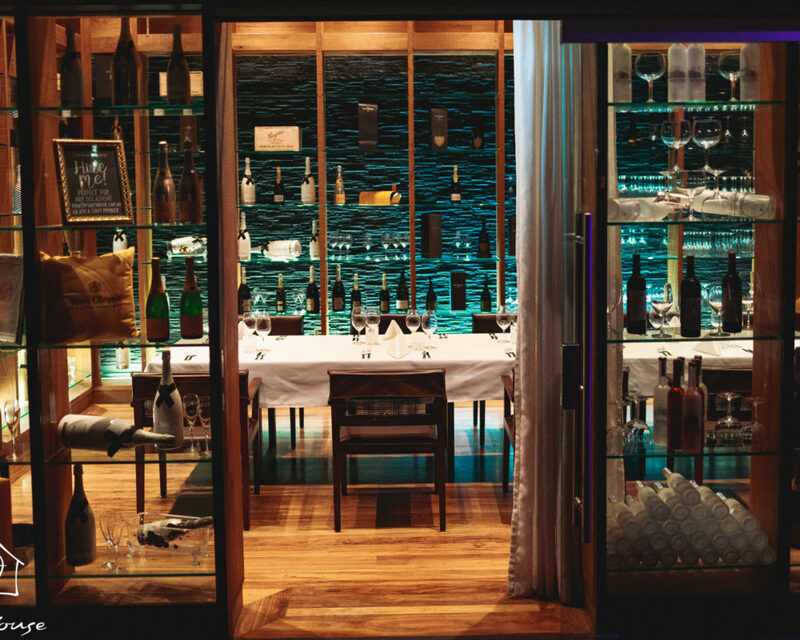 Featuring floor to ceiling windows and surrounded by some of the world’s best wines and champagnes, watch the world go by with a glass of your favourite bubbly. 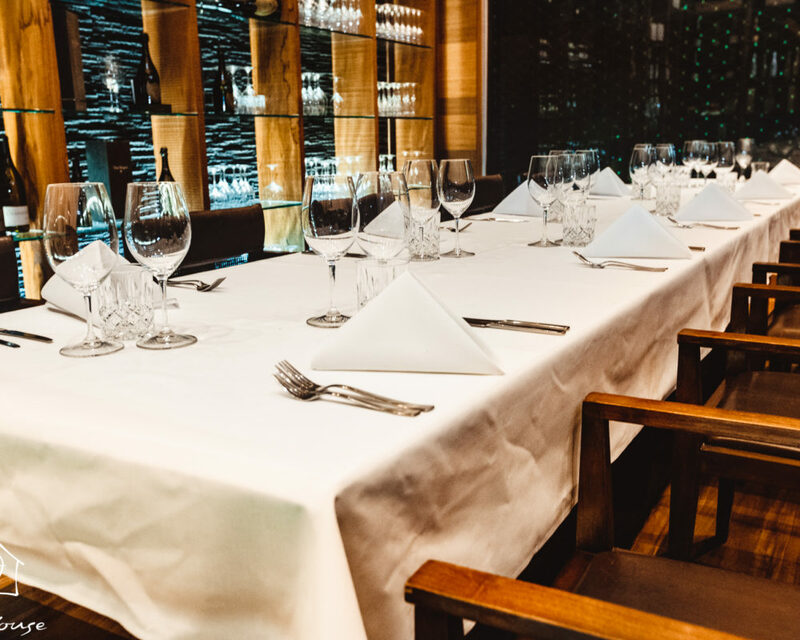 Seating up to 20 guests, our Private Dining Room is perfect for intimate family dinners, board and business meetings, or exclusive VIP events. 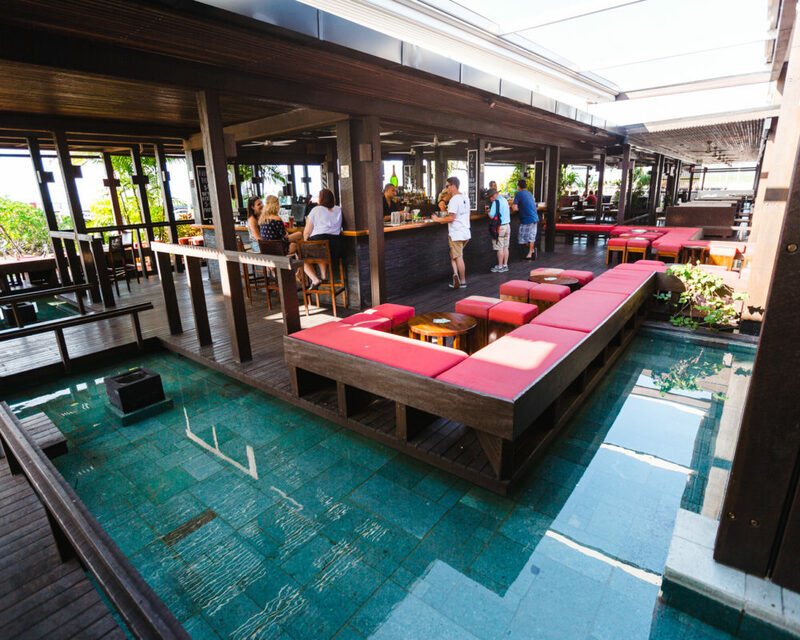 Our island cocktail bar allows your guests to fully experience the outdoor tropical feel of Cairns, with a retractable roof which is able to be opened or closed at a moment’s notice. 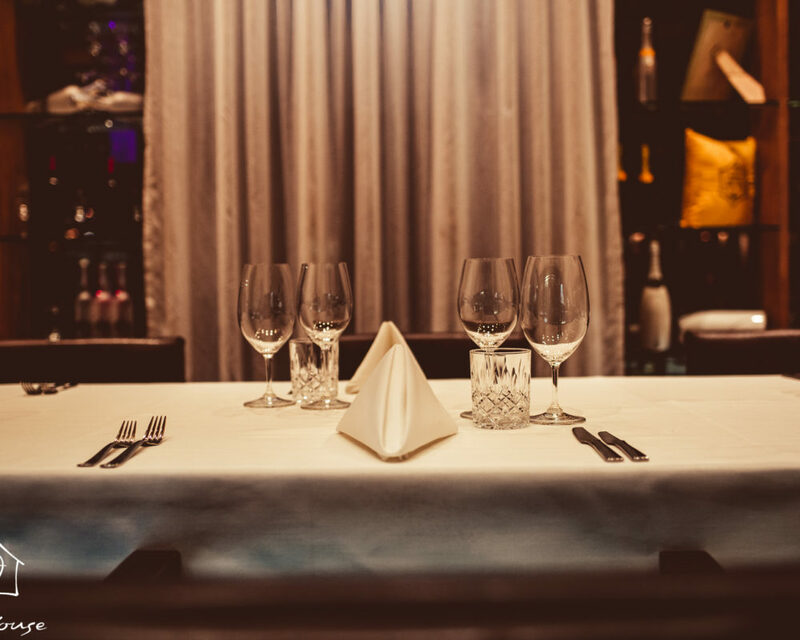 Semi private areas available for hire for small functions or exclusive use for larger celebrations, ceremonies and corporate events. 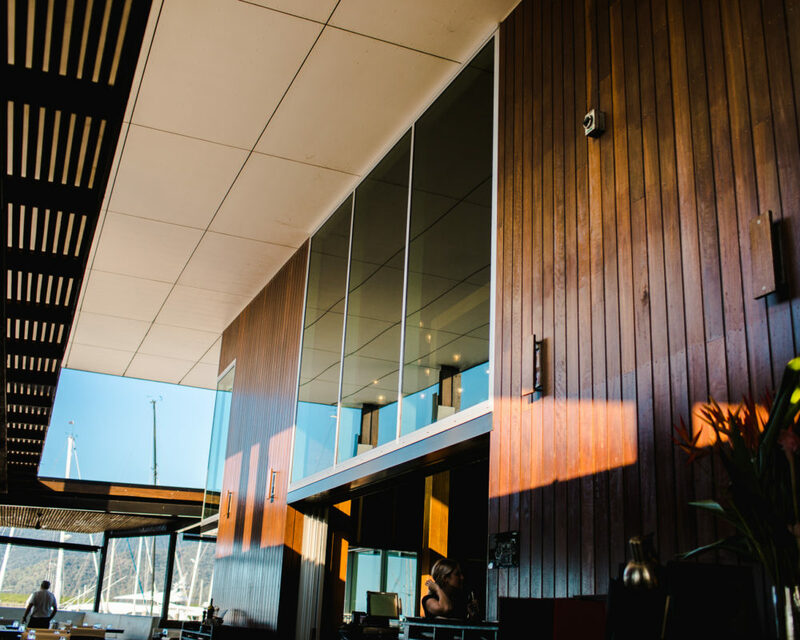 Situated at the front of the venue, our lantern lit sailing bar with purpose built stage and HD projector screen is perfect for private and corporate events. 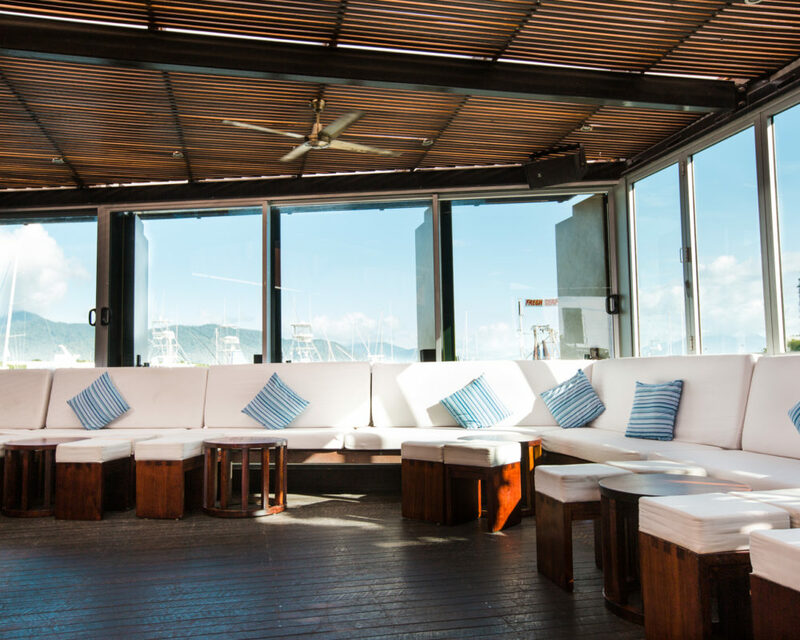 Holding up to 160 guests, this space can be made completely private with blackout curtains, fully functioning cocktail bar, private bathrooms, independent climate control and high quality audio visual. 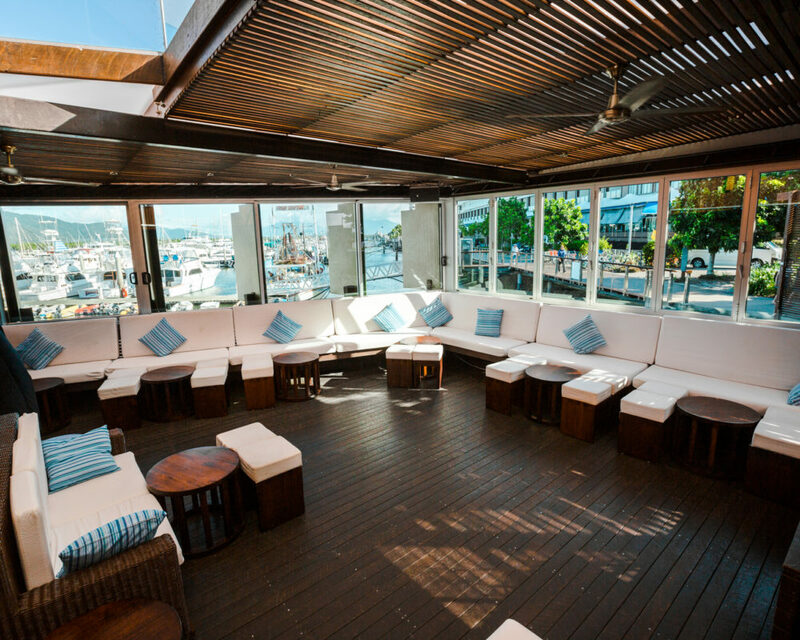 This space can be split in to two areas; the Inside Sailing Bar and the Balcony Area. 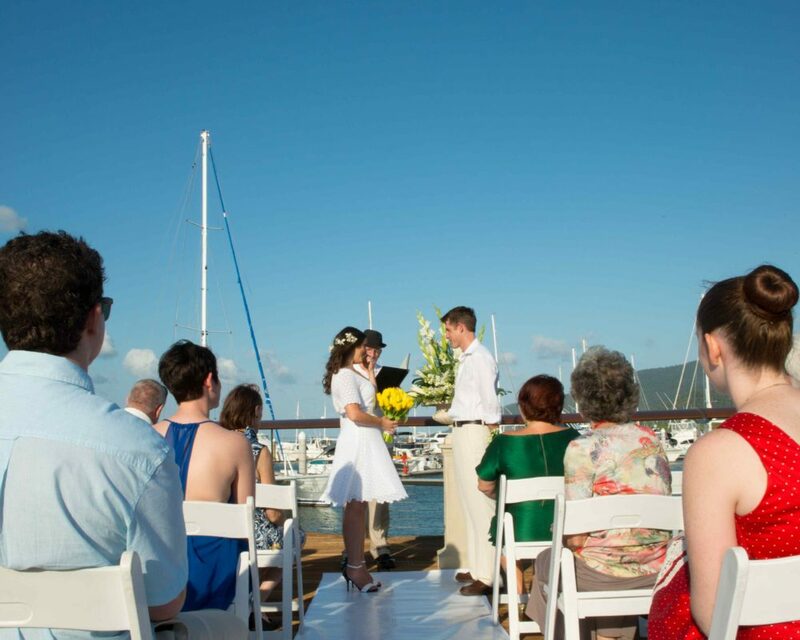 Available for hire together or separately. 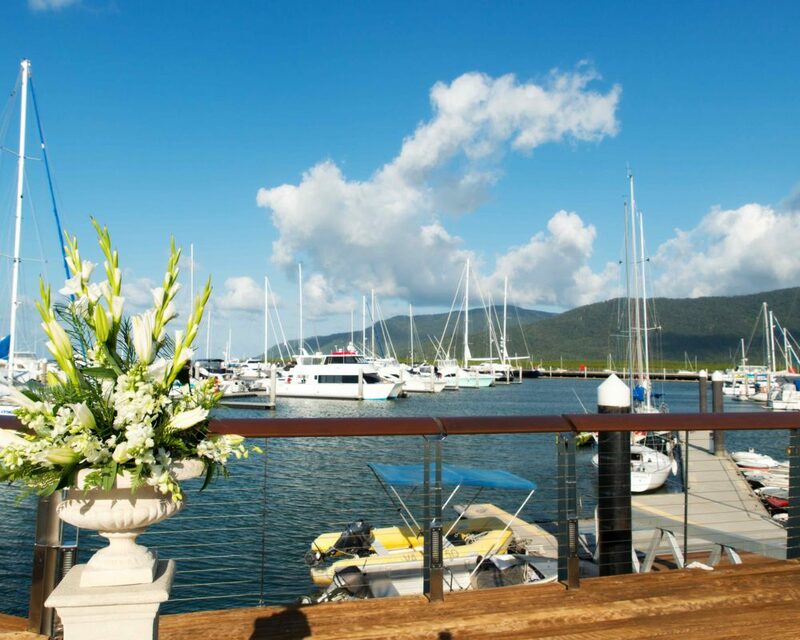 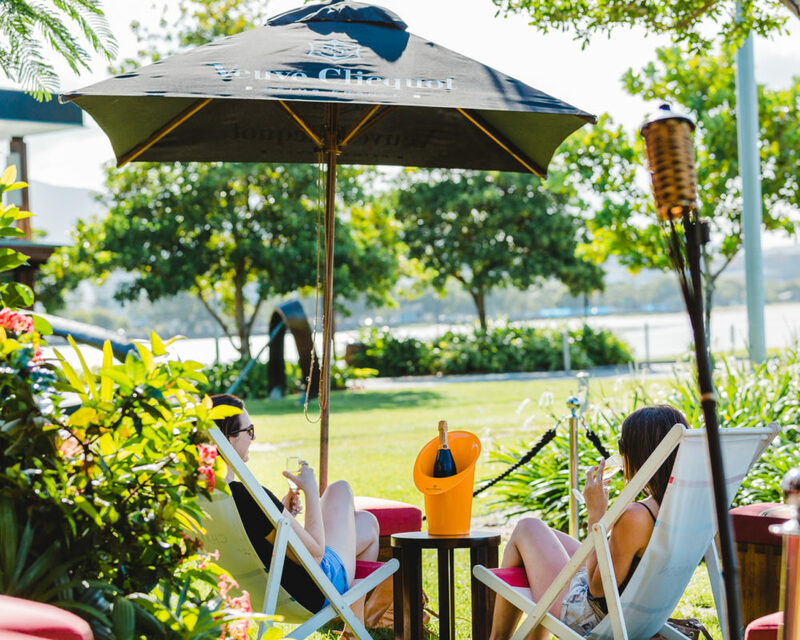 Our beautiful garden at the front of the venue with it’s sweeping views of the Cairns Marina and esplanade is available for hire for corporate promotional events, car or product launches, celebrations and more. 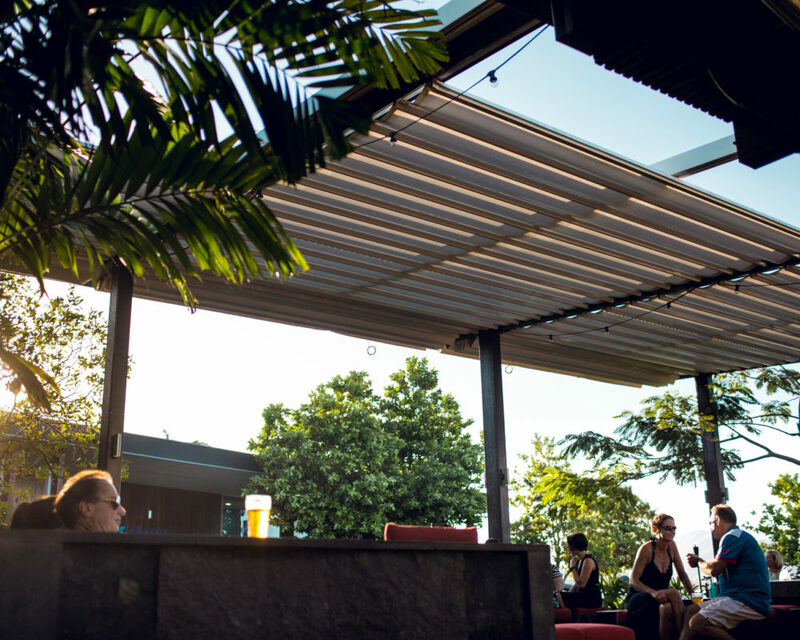 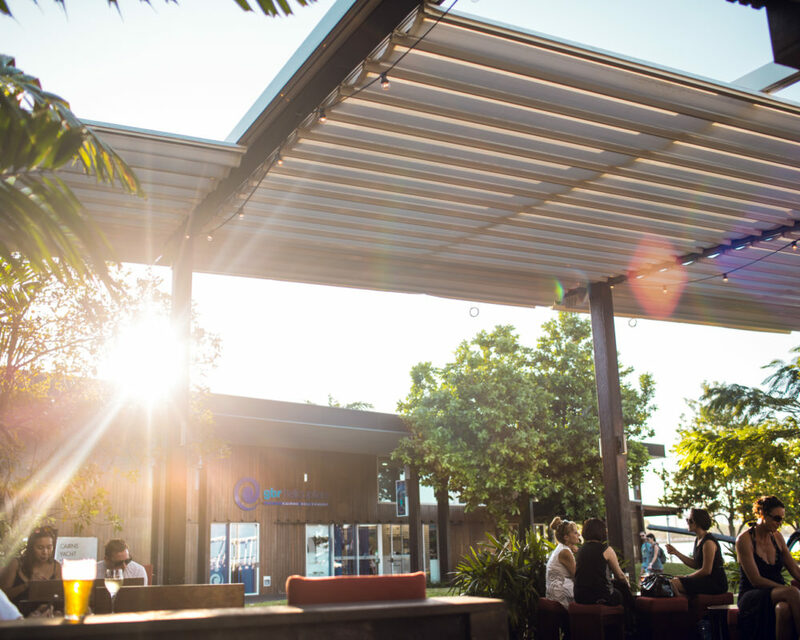 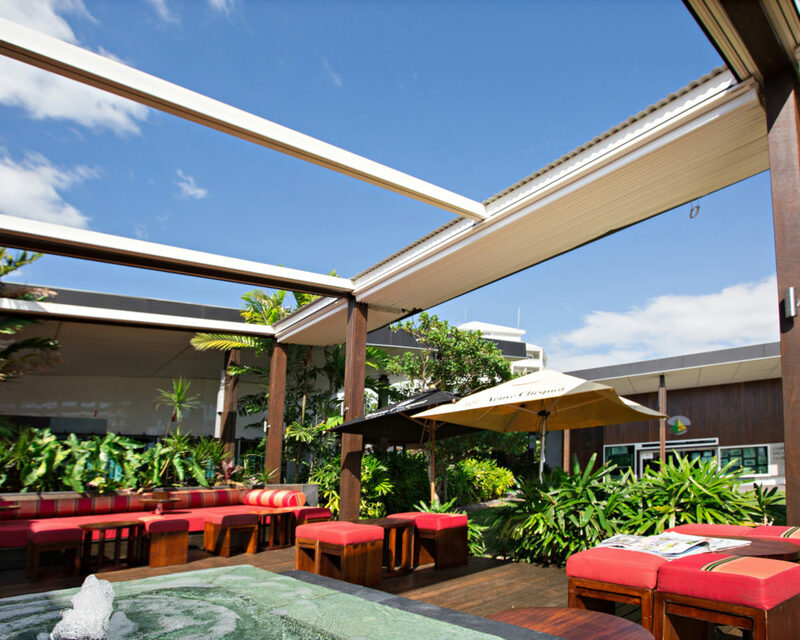 With nothing comparable anywhere in Cairns, our garden is the perfect place for you to hold your next event. 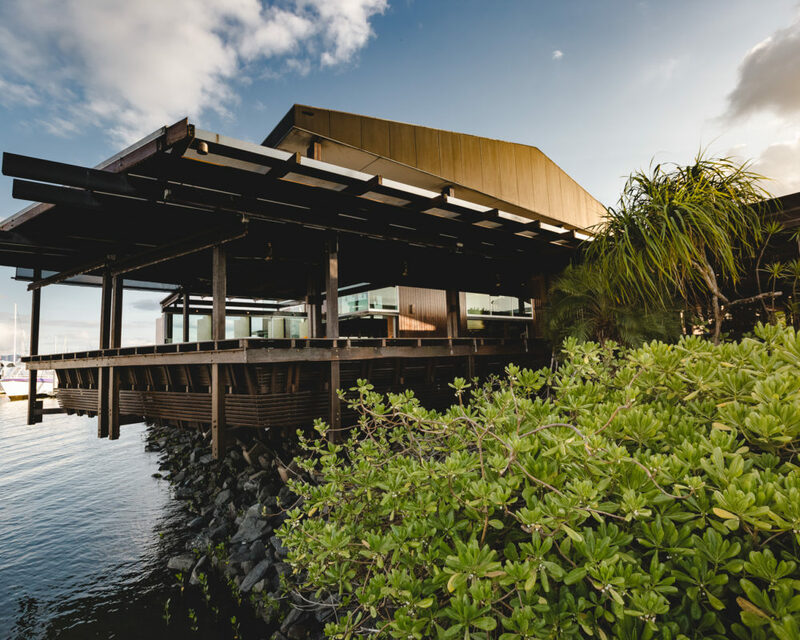 The timber viewing deck adjacent to Salt House is one of the most exclusive and unique location for events in Cairns, holding up to 150 guests. 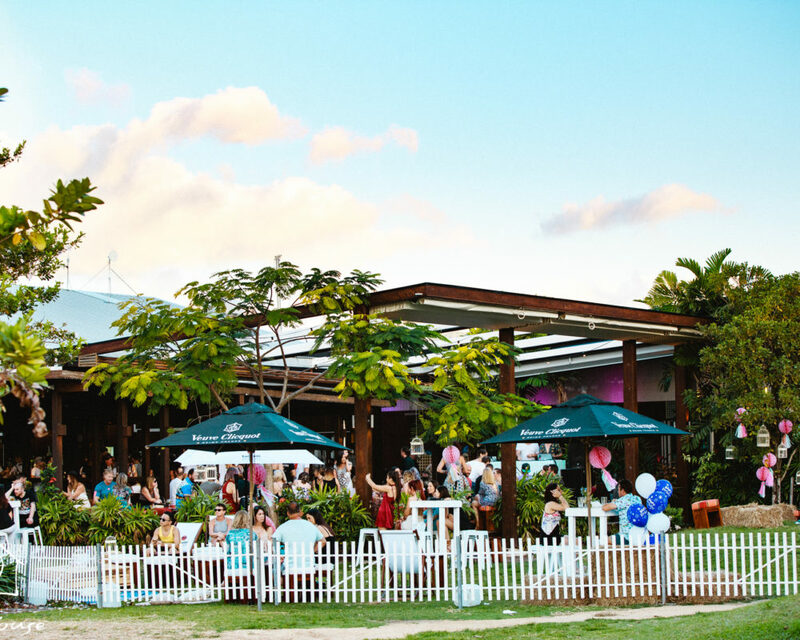 It completely customisable to suit your event and although it is seperate from Salt House, it is still licensed for alcohol. 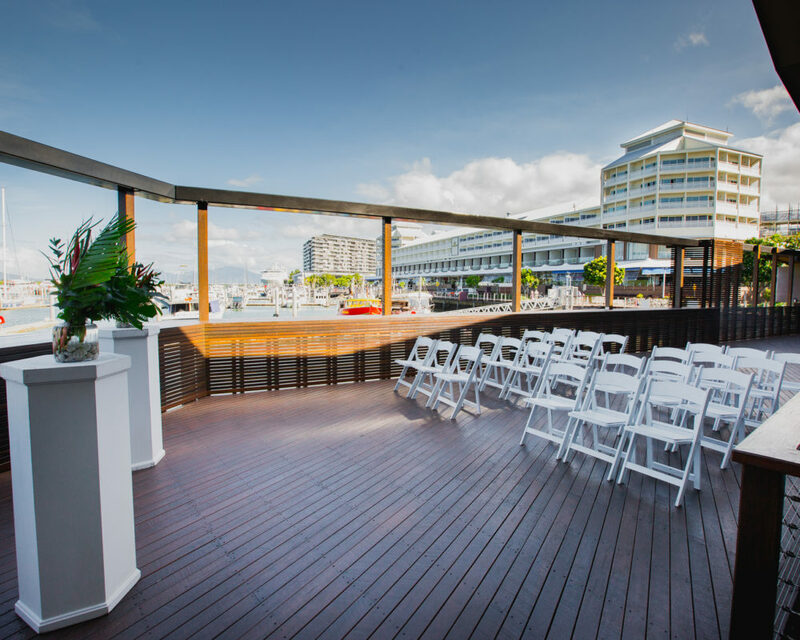 We are in the final stages of building a timber viewing deck that runs along the side of the venue, holding up to 100 guests. 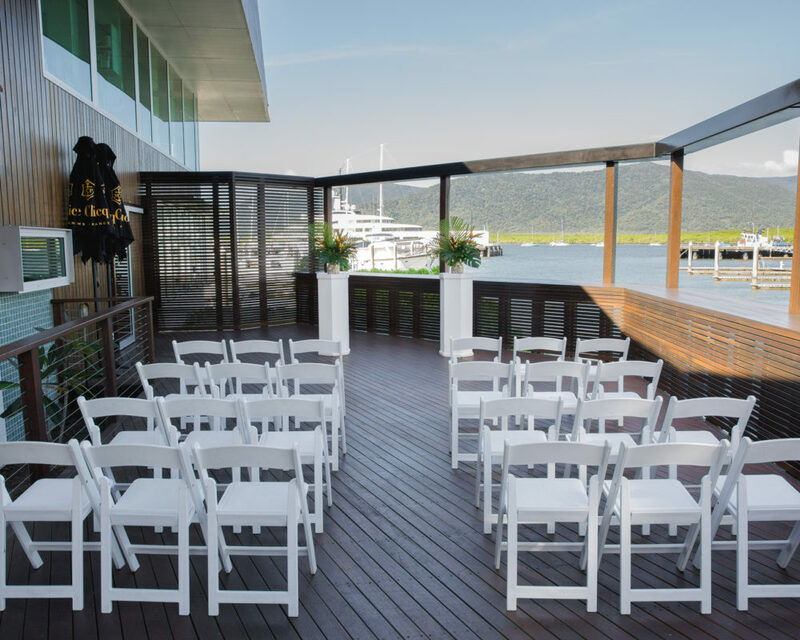 Hire this space to seal your vows in a breathtaking wedding ceremony and finish your big day with canapés for a cocktail style celebration in the bar, or a sit down dinner in the restaurant. 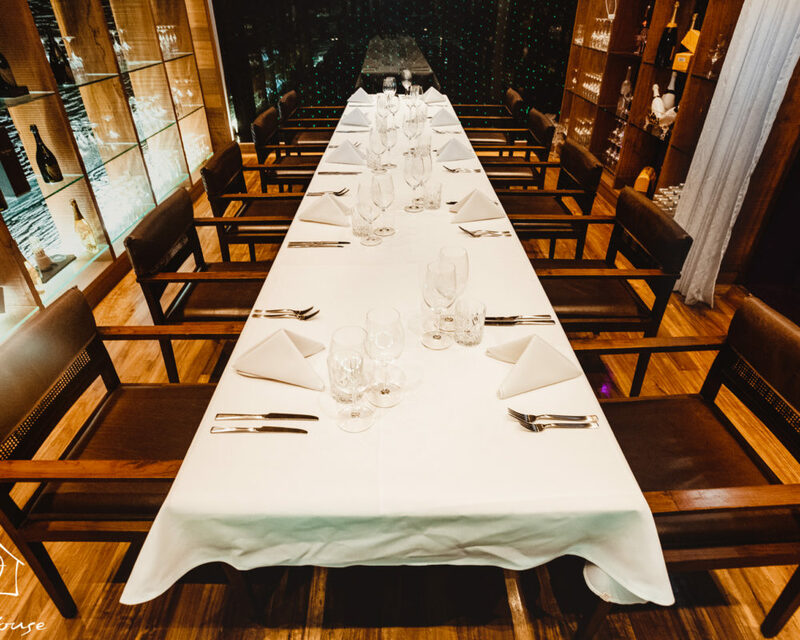 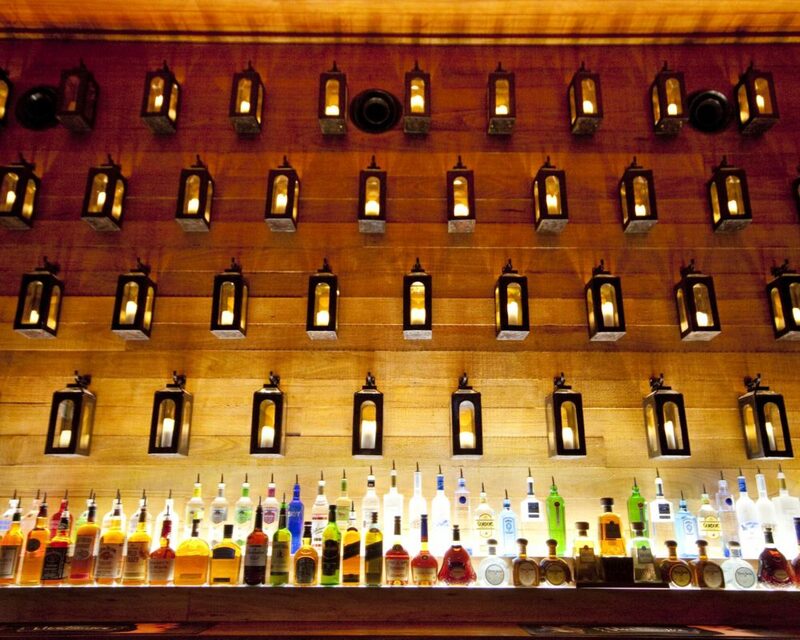 Salt House can be made exclusively yours for any event, whether it is a private affair or an offsite conference dinner. 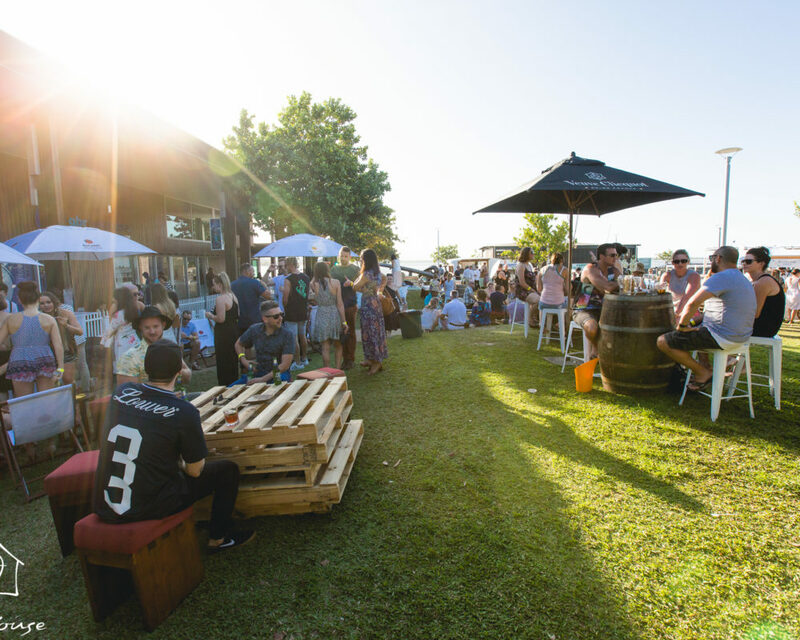 Mix and match – combine various areas of the venue to increase the capacity size. 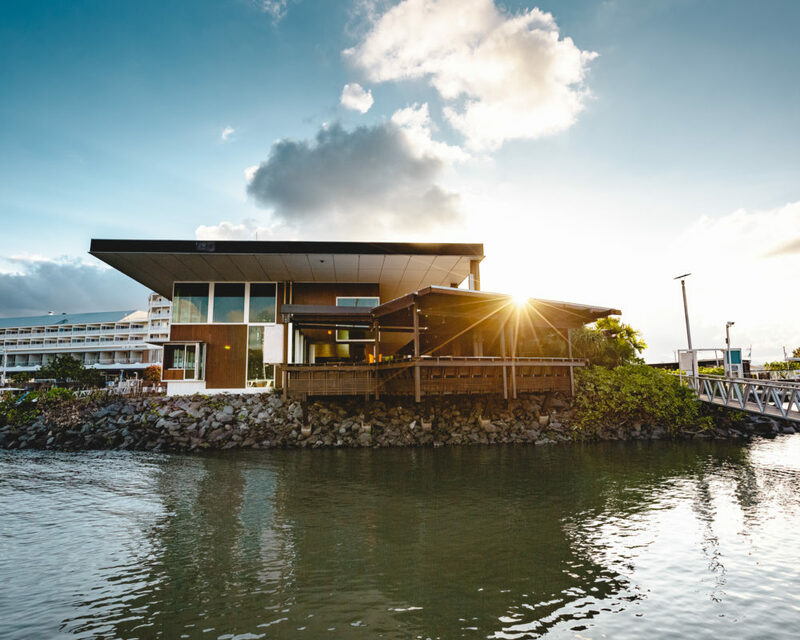 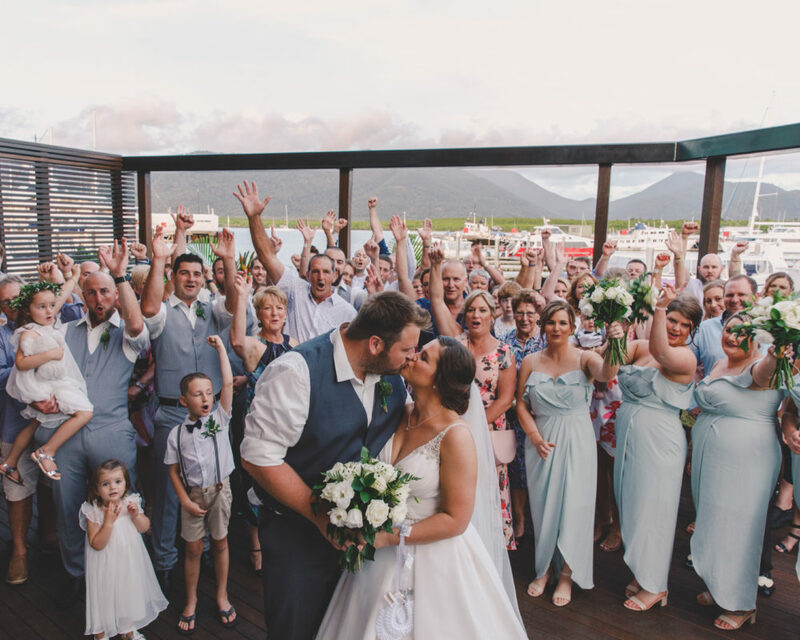 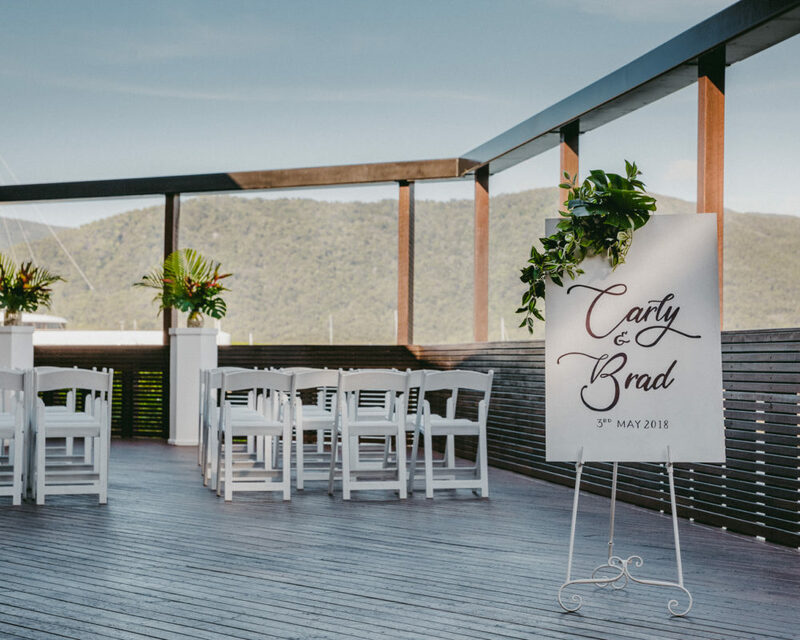 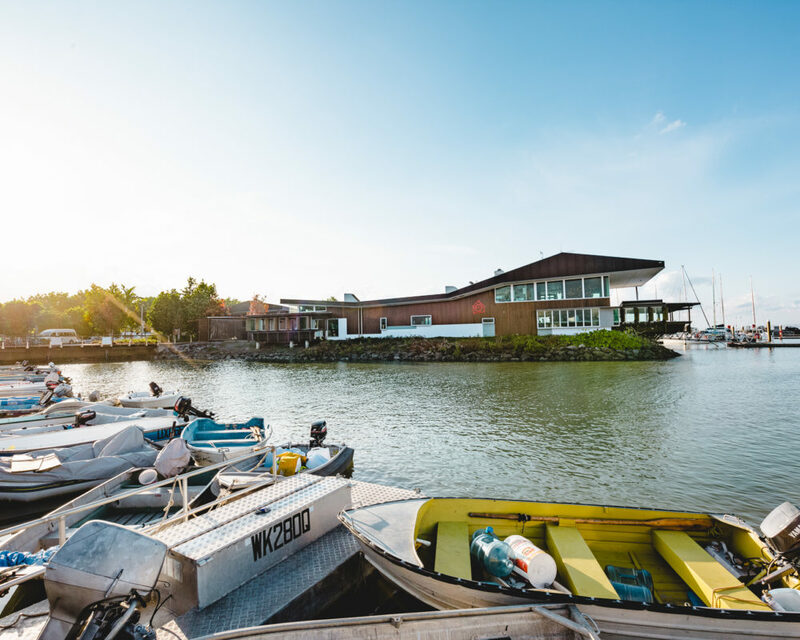 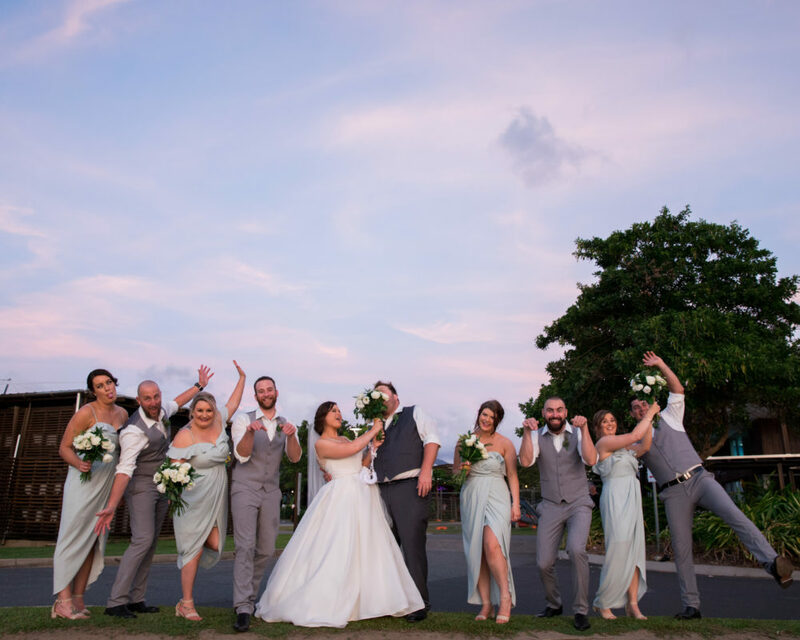 From canapés to food stations and sit down meals, let your vision come to life with the full hire of our venue, with unsurpassed views of the Cairns marina and Trinity inlet, your event is sure to hit the mark.